Knowing how to do something doesn’t mean you have to do it. Many people know how to ride a bike, put together a puzzle, move furniture around your home, or mow your lawn; but you yourself don’t necessarily do these things. This same logic applies to medical billing and coding. Let’s face it, medical billing and coding can be a time-consuming, repetitive process that you may not choose to do. In fact, it wouldn’t behoove you to do medical billing as your time would be better spent elsewhere (for physicians, this would be seeing and treating patients). However, if you’re a medical practitioner, it does behoove you to understand medical billing and coding since, after all, this affects your bottom-line. Comprehensive Healthcare Revenue Management (CHRM) specializes in oncology medical billing, orthopedic medical billing, medical billing for physicians and hospitals, and free-standing emergency services medical billing. Below, we’ll detail the reasons why you, as a physician, need to understand medical billing and coding. Bottom-dollar. The vast majority of the services physicians offer is paid for by insurance companies. The process of collecting insurance claims is known as revenue cycle management or medical billing. 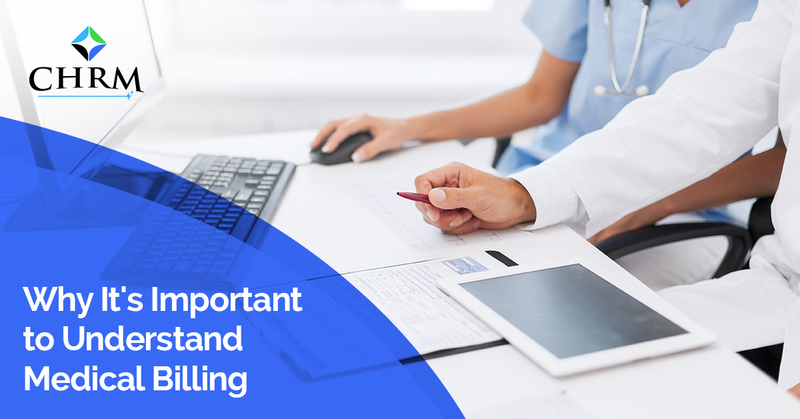 Understanding how to bill for services is crucial to the survival of a medical practice, whether you do your own billing or you outsource medical billing. If you undercode your services (something that is common in specialty practices such as oncology and orthopedic surgery) out of fear of overcoding, you could be leaving money on the table. Furthermore, not knowing which services you offer to charge for (for example, office visit versus a quick, 10 minute, in-patient consultation) can also majorly affect your bottom-dollar. Your practice is a business. Most doctors don’t enter the medical field to gain financial freedom. They enter the medical field to care for people, help people, and ultimately, make their lives easier. Although you enter the medical field for altruistic reasons, you still must turn a profit if you are to survive. You have a staff to pay, a facility fund, and probably a family of your own to support. Furthermore, you can help more people when the lights are not turned off due to unpaid electric bills. Maximizing the revenue cycle for your practice is key to keeping your doors open. Do the medical coding yourself. Relying on your staff, who may not be committed to your practice and could turnover, for medical coding usually results in services being underbilled and errors on medical billing submissions. Moreover, only you and the patient know exactly what transpired in the examination room. You should have some role in the medical billing process, be it as a general oversight role at the end of the day or assigning the codes yourself for services. Familiarize yourself with Evaluation and Management (E&M) Services’ Current Procedural Terminology (CPT). The CPT manual explains in detail how to determine the difference between coding for procedures, such as the difference between a patient visit and a consultation. Knowing how to determine the level of service, how to document it, and how to code for it is key for medical practices, especially when it comes to Medicare and Medicaid billing. Invest your time in online courses and webinars. The internet has a wealth of information on medical billing practices and articles. Capitalize on newsletter subscriptions, articles, and even books online to learn more. Take courses. Probably the last thing you want to do is to go to school more. But when it comes to financial solvency, a short class here and there will be worth it in the long run for the long term viability of your medical practice. You can take short seminars or attend classes as an alternative to full-blown classes to gain a basic understanding of medical billing and coding. Learn about authorization practices and prescription drug coverage. Although this can be extremely frustrating to fulfill the authorization requirements for procedures (especially in the fields of oncology and orthopedic surgery) as well as which prescription drugs are covered by which insurance, this knowledge is important to the patient. The patient cares about his or her costs. Physicians can get caught up in the best treatment options. However, if there is a treatment that is just a step down from the best but considerably cheaper, this is knowledge the patient needs to know. Read your reports. A professional medical billing company such as CHRM provides monthly reports on your revenue cycle. Details such as which procedures were submitted, how many claims were denied, how many claims required additional information, as well as the total amount collected and is outstanding is provided. This information is vital to medical practices looking for ways to maximize their revenue cycle. These reports can tell you the overall health of your business as well as give you feedback on your own productivity. You may learn which office practices are efficient and which can be tightened up. A physician has to take an interest in the business side of his or her medical practice, despite any hesitancy. Ultimately, the physician(s) are the ones responsible at the end of the day for the success of the practice or the failure of the practice. When a physician learns to code effectively so he or she can collect on legitimate services he or she offers, the revenue cycle will be much more efficient and timely. Comprehensive Healthcare Revenue Management offers support for our clients in the medical billing and coding process. We can visit your practice and help train and educate your staff in the entire revenue cycle management process. In fact, we encourage an initial training session in order to help your staff understand our processes and how to make communication between our team and yours seamless. We are always open for our clients’ questions and/or issues about their medical billing. CHRM desires to partner with you in the success of your practice and ultimately to be considered as an extension. When your focus is on your clients and not on billing problems, we’ve succeeded. Contact us today to get started on all your medical billing needs!